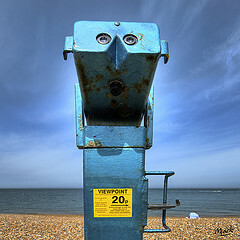 Since the birth of the digital camera, there has certainly never any shortage of photo imagery. In fact, Yahoo! estimates we’ll take 880 billion digital photos in 2014. Our challenge has never been a lack of choice — it’s locating precisely the image we want in this vast ocean of imagery. As Coleridge wrote “Water, water, everywhere, Nor any drop to drink.”. Of course, it can often depend on the kind of image you seek. If you’re looking for commonly photographed objects such as computers, books, or flowers, you shouldn’t have to search long to find dozens of good ones. However, try searching for less common objects, or for abstract concepts — perhaps a sunny day or a particular type of flower — and it can get tougher. Part of the difficulty stem from the fact that even a perfect image, it may not be tagged in a way that allows you to find it. In these cases you can waste a lot of time on various sites with free images and still leave empty-handed. Ouch. This explains why so many commercial stock agencies advertise on free image sites — their search facilities is often worth the up-sell. So, in order to avoid this as much as possible, you might want to try a free image search engine. The advantage of these search engines for free images is that they (in theory) search multiple sites with free images at once. However, in practice some search just a handful of sites, rather than dozens. Anyway, it’s more than nothing but if you hope these image search engines are a blessing, you’d better get realistic. It’s hard to compare the quality of the 7 search engines included in the article. At first I wanted to run the same queries through all of them and compare the results. However, after I tried some very popular terms (‘computers’ in particular) and got thousands of results from some of the engines as well as no results for some not-so-popular terms (perhaps because I simply didn’t use the right keywords), I decided that such a test might give misleading results. What’s more, these search engines index new images daily, so even if today there isn’t a single image for “sunny day”, tomorrow dozens of such images might get added. Therefore, I won’t be comparing the quality of the search for these 7 engines – I will just give my impressions with them, as well as some overall facts, such as the number of photos they include in the search or the sites they search. Before we go on with the search engines themselves, is a word of advice. Even if the search returns images labeled as free for commercial use, always check the source site itself for the latest version of the license. It’s quite possible that images that were once licensed as free, but that later the author had second thoughts and modified the license. Because of this, always check the license before you use the image. For many of us, Google Images is the first (and frequently the only) choice to find free images that are allowed for commercial use as well. 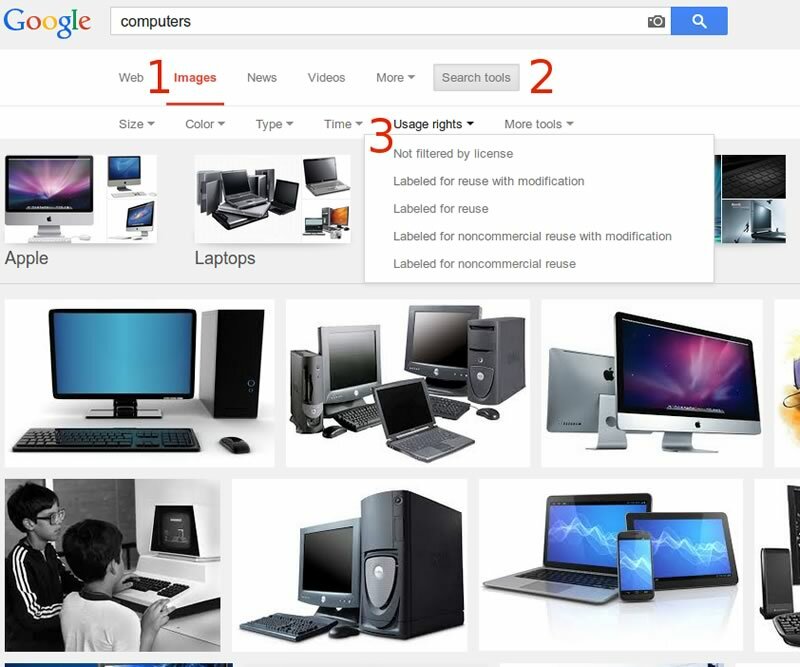 To use Google Images, after you type your keywords in the search box and hit Enter, click the Images tab (1). Then click on Search Tools (2) to open the search options and select Usage Rights (3). From the dropdown that opens, pick the license that suits you. The selection with Google is usually good. For really popular terms it might be overwhelming. Fortunately, they frequently offer sub-results. For instance, for Computers they offer categories such as Apple, Laptops, Clipart, Wallpapers, Parts, PNG, etc. to narrow down the results. For less popular terms and for less restrictive usage rights, the choice isn’t as extensive. Very often you won’t find anything suitable, especially if you are looking for material that is free to reuse with or without modification. In these cases it’s time to try another image search engine listed below. Hey, you didn’t lose much. 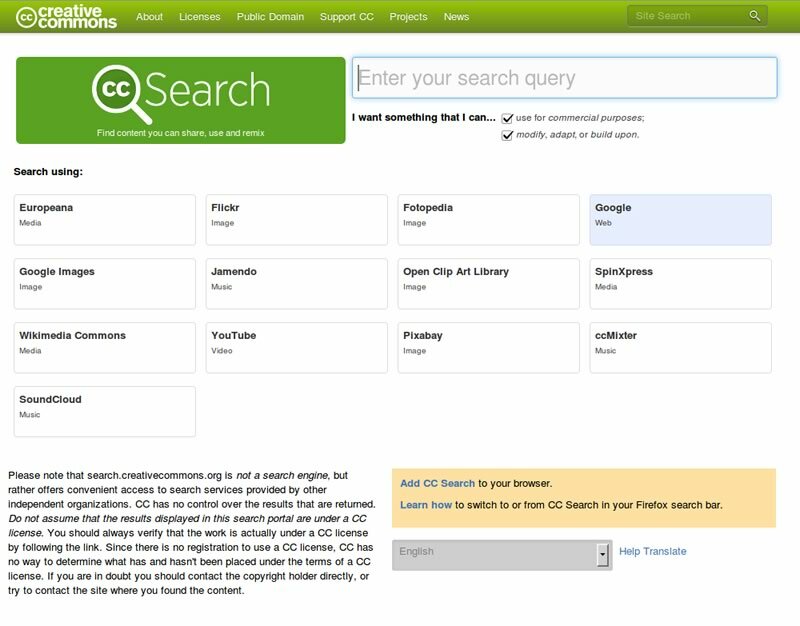 CC Search, short for Creative Commons Search, is one more great search engine for images licensed under the Creative Commons licenses. Though technically they might not be a search engine, as they themselves state explicitly, they offer results for multiple other sites, such as Europeans, Flickr, Google Images, Wikimedia Commons, Fotopedia, Open Clipart Gallery, Pixabay. The problem is that they don’t search all these sites at once. Rather, you enter your search string and choose the site where to search. This isn’t very convenient but still it’s faster than to search all these sites one by one. In addition to images, CC Search offers results for music, videos, and other media as well. You can specify what you are searching for – either stuff that is free for commercial use, or stuff you can modify, adapt, and build upon, or both. If you like CC Search and you plan to use it all the time, they offer a browser add-on (at least for Firefox) to speed your access to the site. Keep in mind that Creative Commons isn’t a pseudonym for ‘free-for-all’. Take note of and honor all linking, accreditation and other usage conditions. On the left you can choose the License Type you are interested in (i.e. Commercial or Noncommercial), as well as how the results are arranged (Recent, Relevance, Interestingness). Of course, there’s nothing stopping you from searching Flickr for creative commons content directly via the advanced search facility. Photo Pin provides two advantages. Firstly it’s simpler, focussing only a licensable content. 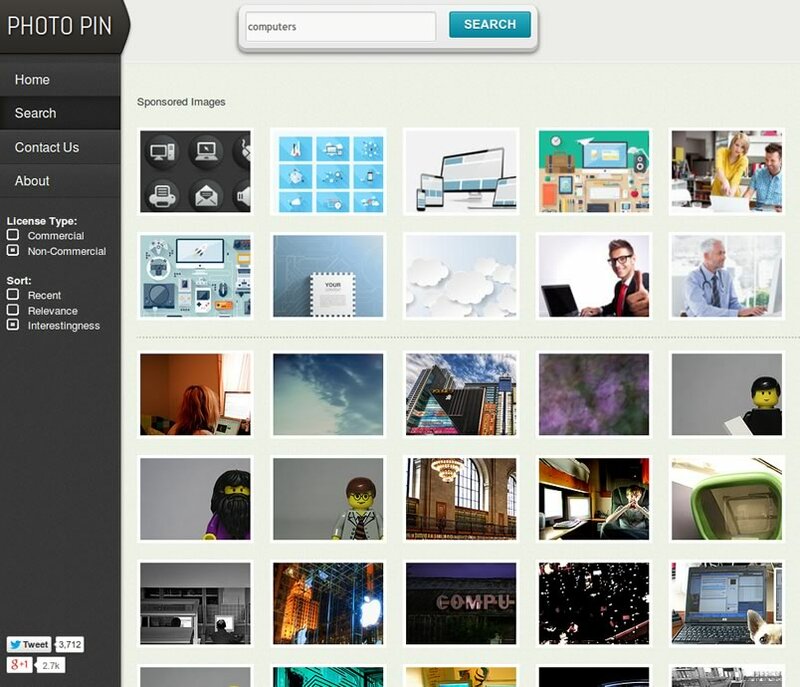 Secondly, Photo Pin makes downloading the correctly-sized image easy, and provides cut-and-paste credit links. 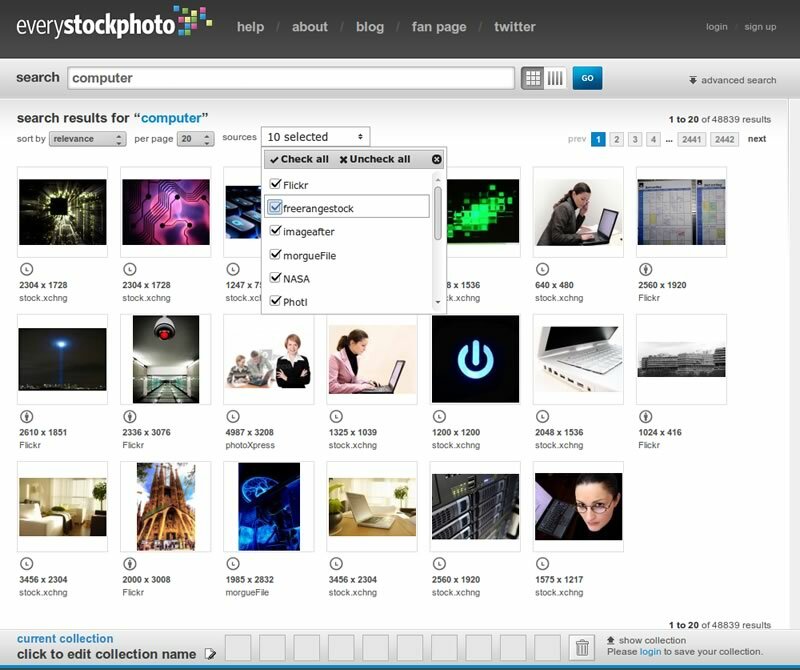 Unlike many of the other services that call themselves ‘search engines’, even though they search Flickr only, PicFindr is more ambitious. It searches more than a dozen of sites for free imagery under a range of licenses (Creative Commons, GNU, and others). Additionally, it has some useful advanced search options that make it even more useful. Some of the sites included in the search aren’t very well-known and some of the popular ones are inexplicably missing, but all in all, this is a really good search engine. 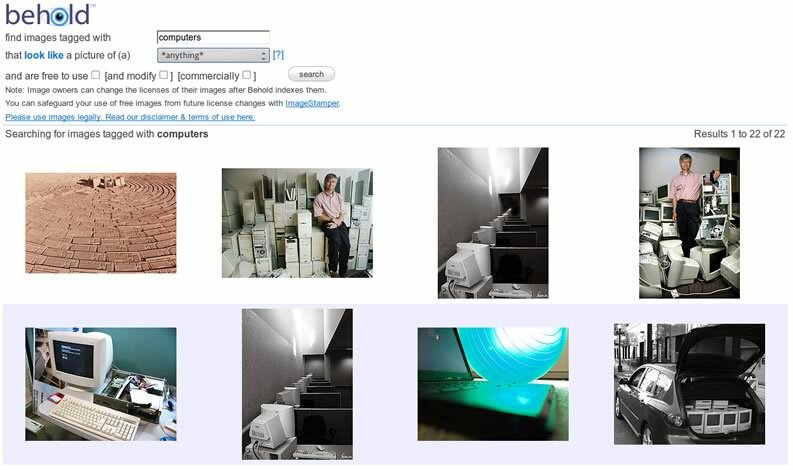 When you hit Search, the search results from Flickr and Wikimedia Commons are displayed separately in sets. You can choose how to visualize the results – by relevance, popularity, or upload date. 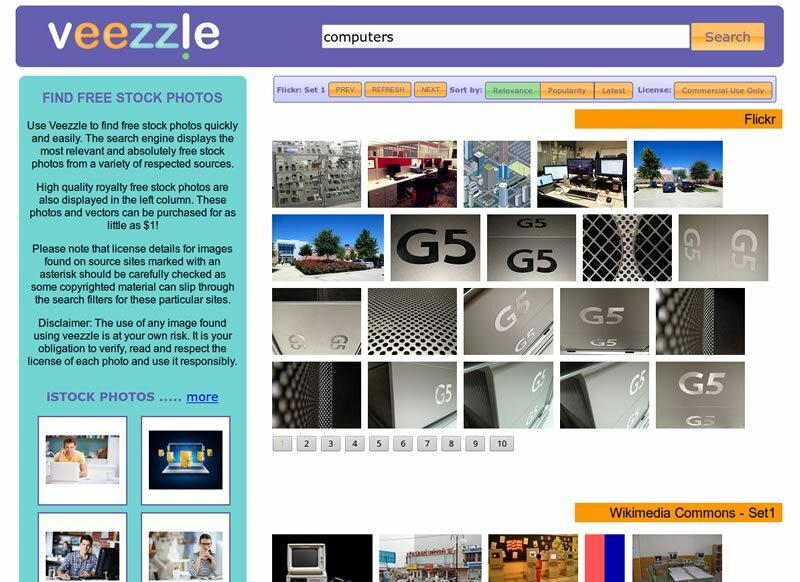 Even though Veezzle is another search engine built on top of Flickr, don’t discount it before you try it. Flickr is so huge and different search engines seem to return different sets of images, so it might turn out Veezzle can serve you the best images for a given serach term. 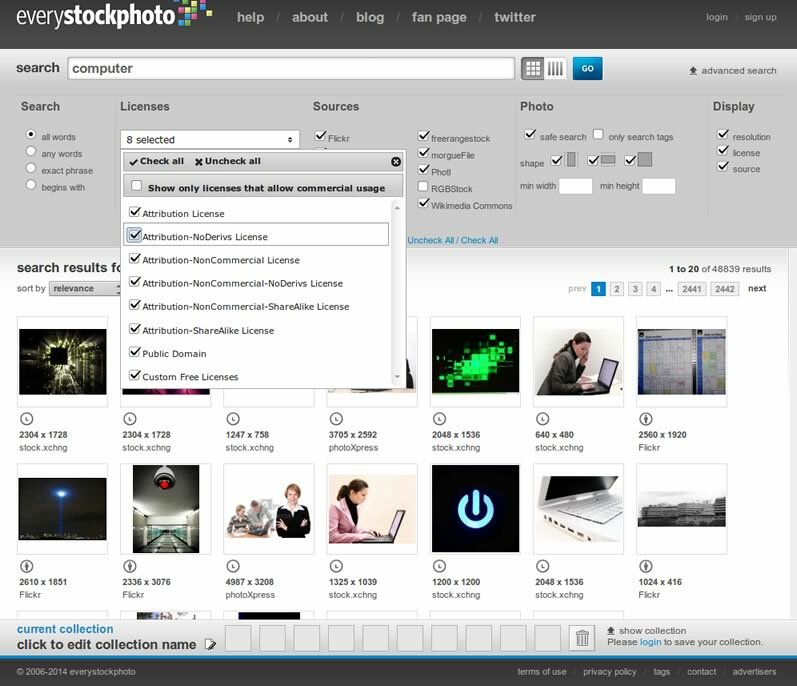 With its almost 23 million free photos, Every Stock Photo is a really great place to search. They search multiple sites. In addition to Flickr and Wikimedia Commons that are to be found on other search engines, Every Stock Photo searches some other great places, such as MorgueFile, SXU, NASA, and Photi. The advanced search options make search even better. They allow to choose the type of license, the source, and what to display (resolution, license, source). For me personally, Every Stock Photo is the second most preferred free image search engine after Google Images. But as tastes inevitably differ, this isn’t necessarily so for everybody else. It might be that the search engine list up to this point is more than adequate, but here is the last one. Compared to some of the other search engines Behold is a poor relative as it lists results from Flickr only. However, unlike some of the other search engines, Behold is very, very fast, which is a huge usability plus. Probably one last interesting feature that deserves mentioning is the ‘Look Like’ option. It allows you to fine-tune your search query, though when I tried it with my sample searches, I wasn’t particularly impressed by the results it retrieved. These free images search engines can save you a lot of time when you are looking for useful images for your site, blog, or design project. However, none is perfect. Even the engines that index millions of photos can’t always return good results, even for not so obscure keywords. Nevertheless, it makes sense to use a search engine instead of browsing sites with free images one by one.